For those who are undertaking haymaking for the first time, this book offers wise counsel and practical advice, providing step-by-step instructions that will see the new or casual farmer through the entire process. From plowing and planting the field to cutting, baling, and storing, author Spencer Yost clearly and concisely explains what to do, citing examples and describing instructive situations from his own experience as a hay farmer. He also includes ample information of the different types of haying equipment and basic machinery maintenance. Also includes informative sidebars on seed types and sowing information; using GPS surveying to estimate planting yields; how to test hay dryness with a microwave oven, and other helpful hints. The art of making hay is as old as farming itself, and even today, no matter how sophisticated the machinery, it evokes the connection of a person to the land. For anyone undertaking the task of making hay for the first time or if you have a few haying seasons under your belt, Small-Scale Haymaking" takes you through every step of the process. 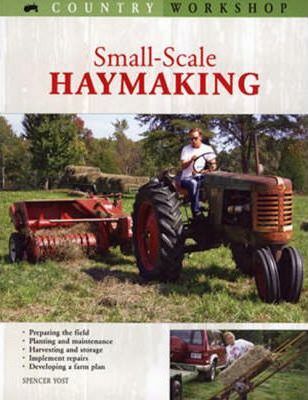 From plowing and planting the field to cutting, baling, and storing the hay, author Spencer Yost explains what to do, citing examples and describing situations from his own experience as a hay farmer.Information about buying and maintaining all types of haying equipment is covered in this book, as well as developing a farm plan for the future. Practical advice and step-by-step instructions will help first-time and veteran hay farmers through the entire haying process to where they can sit back and admire, with pride, a bare hay field and a full hay mow. Spencer Yost has written several tractor-related books, including How to Rebuild and Restore Farm Tractor Engines and How to Restore Your John Deere 2-Cylinder Tractor, and is the creator of Antique Tractor Internet Services (www.atis.net), the original antique tractor website. A computer-industry consultant by day, he lives in Pfafftown, North Carolina.